Confession: I sometimes turned up my nose at "light" cookbooks because I didn't think that I could identify with the recipes. 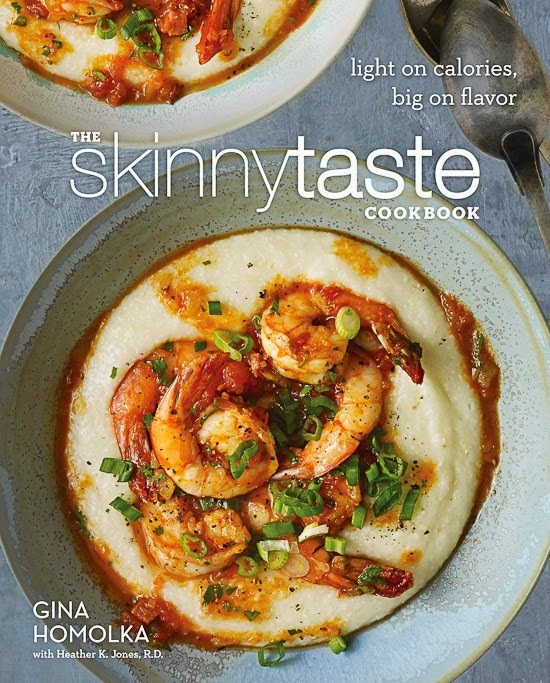 However, when I received a review copy of The SkinnyTaste Cookbook by Gina Homolka, I was immediately impressed by everything this cookbook had to offer. I quickly realized that these recipes and cooking methods were much more closely related to the way that I prefer to cook such as using olive oil instead of butter. Since I don't eat cheese and very little dairy products, I always found myself trying to remove these ingredients from recipes. It is wonderful to find a cookbook that has recipes that aren't drowning in cheese and cream sauces. Whenever I pick up a new cookbook, I like to mark the pages that contain recipes that I want to try. There have been many times when I've gotten to the end of the cookbook and haven't marked one single page. That definitely wasn't the case with this cookbook. Every time I go through this book, I am more and more impressed with the recipes. There are just so many of them that excite me. I could go on and on about these recipes. I am not exaggerating when I say how appealing these recipes are. The salad chapter in most cookbook is usually the chapter that I skim through with little enthusiasm. Why would I be interested in a salad? But, I've found myself drawn to Coconut Chicken Salad with Warm Honey-Mustard Vinaigrette, Buffalo Chicken Salad, and Turkey Santa Fe Taco Salad with Avocado Crema. I'm actually looking forward to making a salad now. I never thought I would say that...ever! This cookbook contains recipes for breakfast, soups & chilis, sandwiches, appetizers, salads, main dishes (poultry, lean meat, fish, meatless), side dishes, and desserts. Icons throughout the book tell you whether the recipe is vegetarian, gluten-free, quick, freezer-friendly, or slow cooker-appropriate. Each recipe also contains nutritional information. The SkinnyTaste Cookbook is one of my favorite cookbooks of 2014 and I think it will be one of yours, too. Buy it - you won't be disappointed!